I get it now, when Nonna tells me ” I don’t have a recipe, I just know.” Why?, because this weekend I learn’t how to make ravioli with brother No 2’s girlfriend. Her background is Maltese and her family makes pasta quite often. She needed to make a big batch for a family function of hers that was coming up and I mentioned how interested I was in learning how to make it from scratch. She said great and was very happy to have a second set of hands in the mix. I offered to get the filling and bring wine for dinner for the ‘after the pasta making’ session and she said she would do the rest. 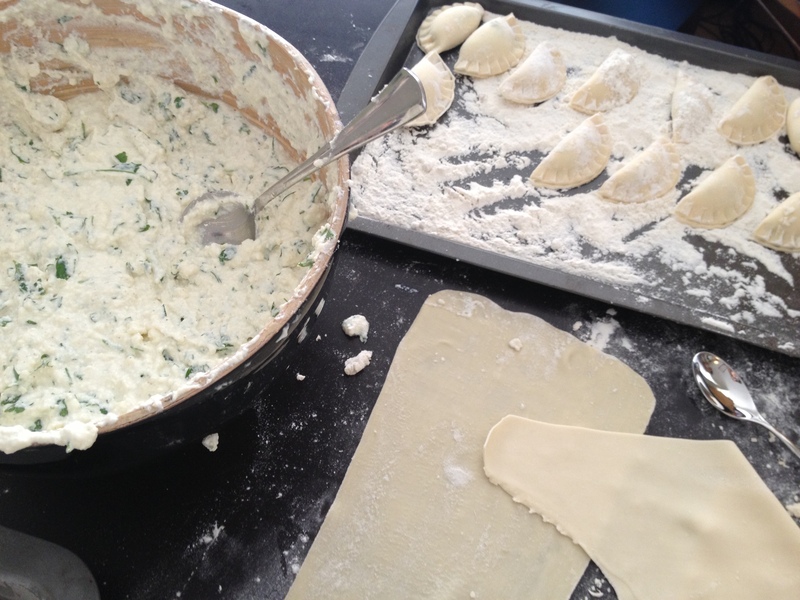 The filling for the ravioli was ricotta, parmesan and parsley…simple, yes, but I was assured that if we have the best quality ingredients we wouldn’t need anything else. She got parsley from her parents garden and I knew of a place that makes fresh ricotta that I could buy direct from the producer – word also got out and I ended up getting extra for family – a total 9kg of ricotta and some parmasen in fact. The Italian lady I ordered it from gave me a quizzical look for ordering that much but as soon as I held that ricotta, I knew it was worth coming here, it is was so fresh and still warm. We set up at her place with another extra set of hands from the youngest sister, so we were ready to begin. We started with mixing the filling which was done by hand so you can feel and taste when it is ready. Extra pepper and parsley was added to really give it a punch of flavour. Then it was onto making the dough. We had a basic recipe to follow and at first I was just following her step by step but after a while I got used to how it is meant to be – the feel between my fingers, if it needed more flour or water and thin enough to just be able to see my finger tips through the pasta. During our dough session, the eldest sister arrived and offered to help and if she could enjoy it when we were done. We had a little factory going now, we filled and cut out the pasta like an old Nonna, one that had done it a thousand times, our job made easy with the pasta cutters. We needed to portion and freeze them, flouring each piece so they wouldn’t stick. Pasta making is definitely a workout…no wonder there was no need to go to gyms in our Nonna’s time. We made a Neapolitan sauce to go with the ravioli, well the type we made is called Agnolotti the difference being instead of being made from two squares of pasta, ours were made from one round piece and folded – they were named after a cook Angiolino from Monferrato, known as ‘Angolot’ and they had different fillings for different feast days. Sitting down to dinner after making it all day was such an achievement and a joy watching our loved ones eat it. I can imagine this is what the Italian and Maltese women feel when they make it for their own families but on a weekly basis. The fresh Riccota made a huge difference, it was so creamy that the pockets of pasta oozed in your mouth like honey. I am so blessed to have this knowledge to pass down to my own friends and family. Bellisimo! 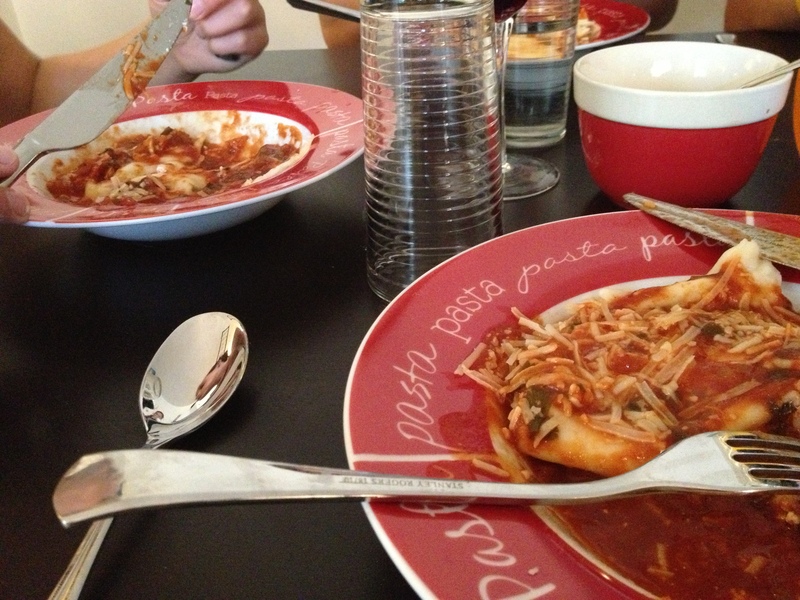 This entry was posted in Family Dinner, The Word from Nonna, Voilà and tagged familydinner, Nonna, pasta, riccota by wordofthenonna. Bookmark the permalink. What a wonderful and lovingly written post. Your pasta is beautiful. Complimenti! Thank you for the kind words, Im only new to blogging and its nice to have a new follower. I love your simple filling – ricotta, pepper & parsley. The pasta is the main attraction here, accentuated by the sauce, I’m imagining the texture and creaminess of the ricotta would have danced on your tongue – so hungry now! Your photography is excellent, makes me feel like I’m there, at the table drooling! Thanks Abbie. I’m happy that my dish is making you drool seeing as your writing makes me do the same. 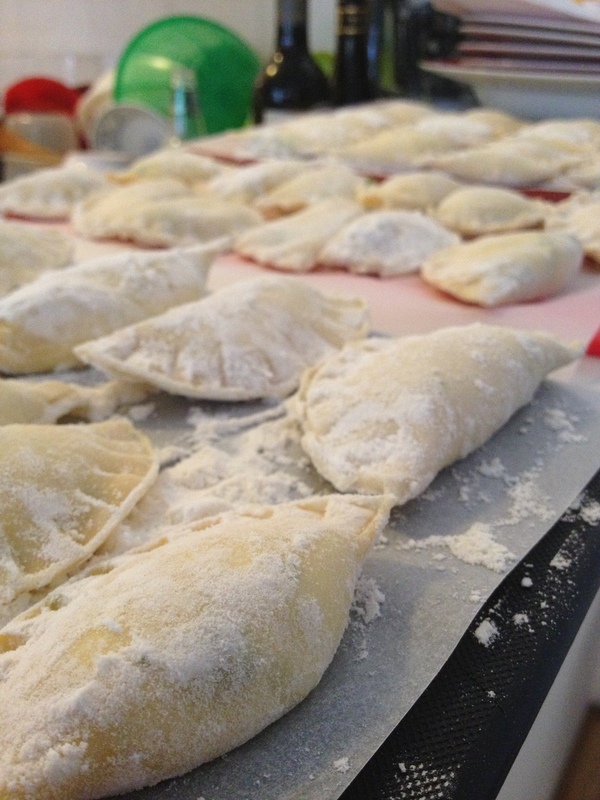 I love making ravioli, it is always best to make it with a group of people too. Looks really delicious. We are hoping to get all the family together soon to make some more.